In her video project, “In the Future They Ate from the Finest Porcelain” (2014), Larissa Sansour enters the fictional world of a resistance group who bury porcelain remains of an imaginary civilization to influence history and support their claims to land and sovereignty. Shuttling between past and future, the film uses science fiction aesthetics and speculative language to re-write the history of the future and lay claim to home. Similarly, Morehshin Allahyari’s ongoing project titled “Material Speculation” (2015) reconstructs archeological artifacts destroyed by ISIS in 3D format , archiving lost objects by including a digital memory card inside each newly constructed artifact. Sansour and Allahyari use the science of past-making to enter into the future. Yet unlike archeology’s attachment to stable land, they propose a virtual archeology of landsand artifacts already lost. I argue that artist such as Sansour and Allahyari launch an ethnofuturist aesthetic geared towards a sustained relationship with otherness, defying temporarily by claiming their politics in the imaginitve space of the future and the speculative space of hope. 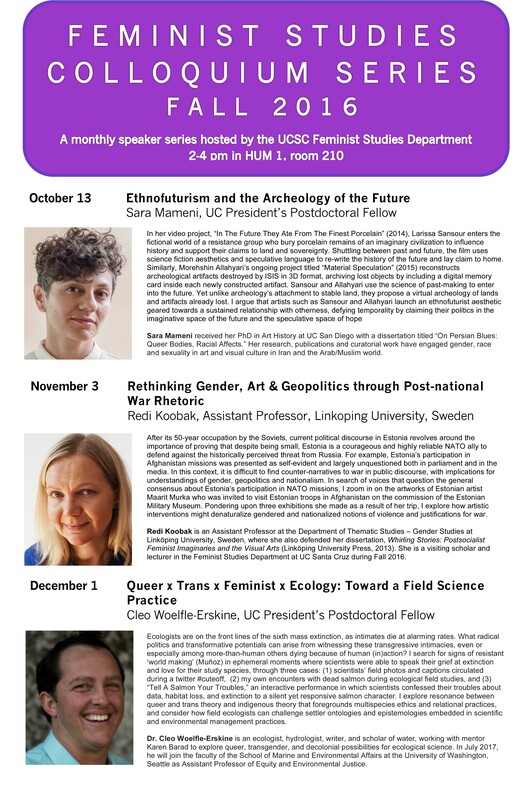 Sara Mameni received her PhD in Art History at UC San Diego with dissertation titled “On Persian Blues: Queer Bodies, Racial Affects.” Her research, publications and curatorial work have engaged gender, race and sexuality in art and visual culture in Iran and Arab/Muslim world.